← Guide to volunteering in doing overseas charity work. Part 1. In between looking after systems at work and sometimes staff’s personal computers when I have a quiet day, in my workshop this week is an old Pentium 3 computer that is about 8/9 years old. It came from our Japanese office (don’t ask how it got here) and had Japanese Windows XP for our staff from Japan that volunteer here. These days its never used as we have one computer for volunteers to upload their pictures, go on Facebook and do any personal web browsing and email, we have people from dozens of different countries and they all speak English, including recent Japanese volunteers. Obviously its not really practical to maintain it, as I don’t speak Japanese, as all the text appears in Kanji text. This computer only has 1Ghz processor, its old and redundant. One of my colleagues who deals with food delivery to needy families asked if we had an old computer no longer needed.. 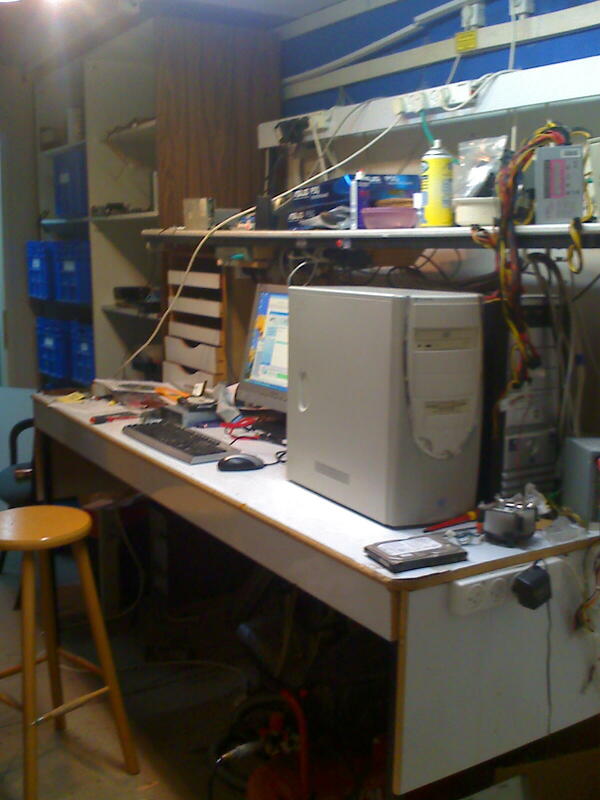 When I sometimes have a quiet day, I often fix other volunteer’s personal laptops, and also have fixed a PC that belonged to a local Arab family. So grabbing it from a dusty corner, I put it on my work bench and tested it out. Looking through my boxes of spare bits, I now have 1Gb of memory and replaced the CD drive with a dodgy eject mechanism with a LG CD writer. It doesn’t do DVDs, but another driver could be bought quite cheaply and easily fitted. I put on a normal installation of English Windows XP Home edition. There is no Windows licence sticker on it, and I have a spare licence code from another HP PC that had a bad motherboard, as the stickers are not easily removable, I hacksawed a square out of the case with the sticker, and put the rest of it in the bin. I have saved licence codes from other computers in case someone wants to escape from the ghastly horrors of Windows Vista, I keep a library of CDs of all different versions of Windows XP, and despite XP’s 9 years on the market its easy to customise it to how you want and extra aesthetic features and functionality of Vista and 7 can be copied to some degree. After setting up both English and Hebrew keyboard support and set all the region and language options to Hebrew and Israel. 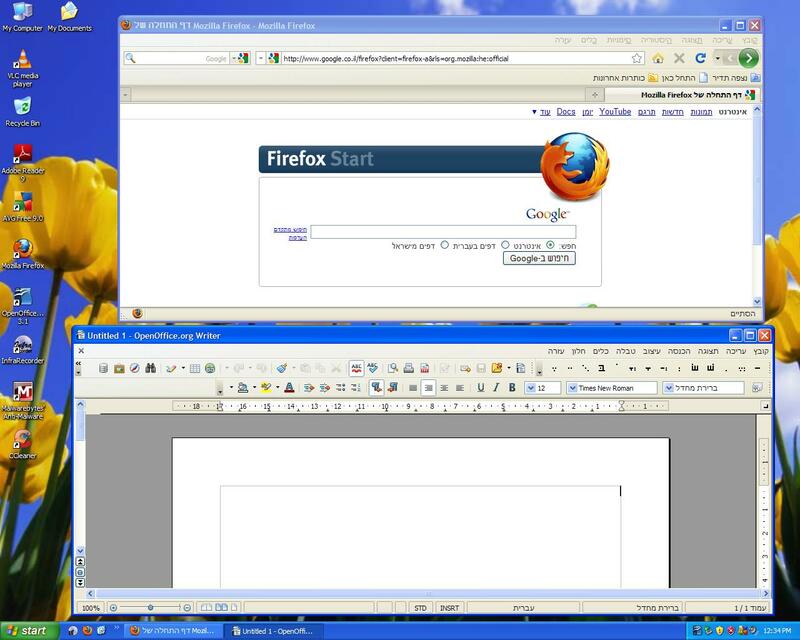 I downloaded the Hebrew versions of Firefox and Open Office. You can find all language versions of Firefox here. Note, as Hebrew is a right to left language, icons and menus follow the same way. Interestingly enough Open Office shows these little dots you put under Hebrew symbols, not so much done with modern Hebrew but often used on religious books. Open Office is a good free alternative to Microsoft Office, as I don’t have a legal free licence I can give away. For almost all regular writing and spreadsheet requirements this does a perfect job and costs nothing. You can download it here. Versions for non-English users are here. The Hebrew version is on a totally separate page here. There are versions for Mac and Linux computers as well. Here in Israel I like the fact that more things get repaired here, ie: TVs, jewellery, shoes, etc, often this is not always the case of too much hassle to repair something, its a case that there isn’t enough skilled people to do it. Jewish people seem to always have a knack for repairing and working with small precision objects such as jewellery, watches and such. Skills that are passed down in generations I guess. I think its daft in how people call this “recycling” of PCs. Recycling is normally breaking something down to its component value for parts of for scrap materials. If I buy a car that 8 years old, its not a recycled car, it just past through several owners, seeing as not everyone can buy goods for the original asking price and have to make do with something older at a fraction of the value. Also this month I have virtualised an important system, for regulat non-IT folks this just means one computer pretends to be two or more computers having multiple versions of Windows simultaneously. If the physical hardware breaks, a single file that contains the extra invisible PC can be quickly copied onto a another physical box, meaning less than hour of down time. This saves our organisation in less hardware needed (One PC freed up for a spare unit for next member of staff) and also electricity usage.